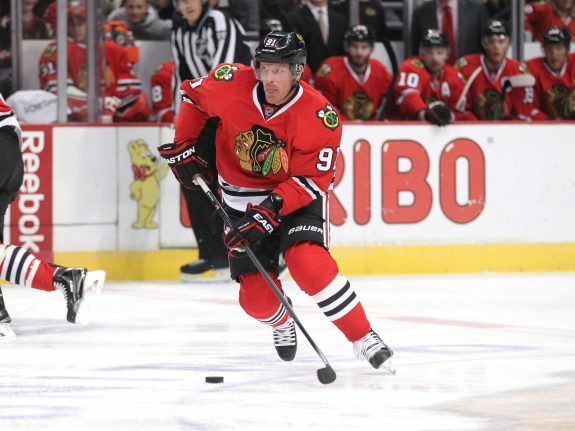 In this, our second installment of Blackhawks Cross Talk,The Hockey Writers scribes Steve Sobel and Michael Szwaja discuss Brad Richards, roster surprises and more. Got a question you’d like to hear our answers to? Be sure to let us know in the comments! Szwaja: Ask me last week, and I would have said massive failure. Richards looked slow, lost and disinterested. It got so bad Joel Quenneville relegated him to his little used fourth line for a few games. He’s been better of late. He’s off the fourth line now, and he’s assumed his familiar point position on the power play, both of which have seemed to get him in his comfort zone. He has three points in his last five games, but he’s also -1 and averaging only 12:35 of ice time in that span. Bottom line is he has to be better for a team with Stanley Cup aspirations. Sobel: He got off to a slow and unimpressive start, but is looking like a serviceable 2nd or 3rd line center. We knew going into it this was a gamble, his last season with the Rangers didn’t look good. The Blackhawks are arguably in a “cup or bust” situation given the increase in the Toews and Kane contracts starting next year, and they opted to gamble on Richards to add that missing piece this year. 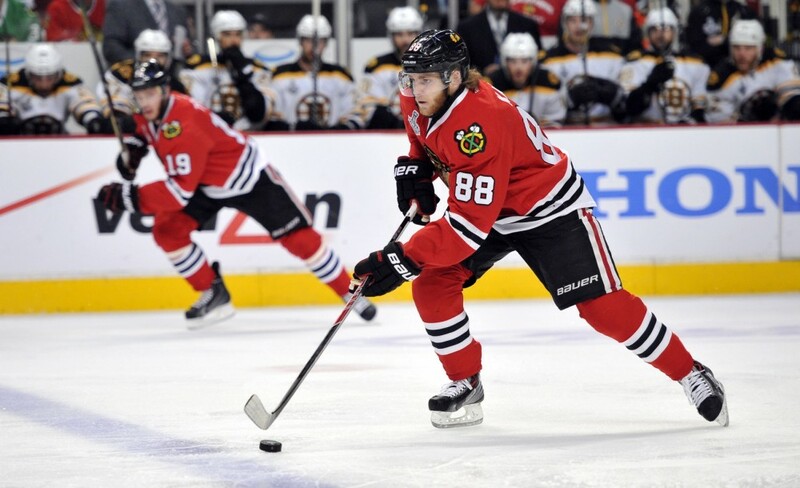 There’s no question that the Blackhawks don’t intend to keep Richards beyond that timeframe – there’s no space. Ultimately, it seems like the gamble is taking time to pay off, but may just do that over the course of the season. Who is the biggest surprise on the roster (or not on the roster) thus far? Sobel: I’m shocked that Trevor Van Riemsdyk has come out of nowhere and looked so solid. He doesn’t just look like a capable 5th or 6th D-man, which is all we were hoping for from the Blackhawks pool of prospects, he actually looks like a serviceable second pairing guy with some offensive upside. He moves the puck well from his own zone, jumps into the play sparingly but wisely on offense, and generally can be trusted to stay at home when needed. Given the aforementioned cap issues next year, the Blackhawks will likely have 2 or 3 open D slots to fill, and it looks like TVR may just be in the process of locking down one of those firmly. The Blackhawks social media accounts have started sharing advanced analytics much more prominently this year – love it or hate it? Szwaja: Love it. Like it or not, advanced analytics are here to stay in hockey (and all other sports). Teams are hiring numbers gurus to work in their front offices now. If those in charge of NHL rosters are turning to numbers, then so should people like us who love and follow the game. Sobel: I’m a huge fan of advanced analytics, and have been consuming them for years from top notch sites like Behind The Net, Copper N Blue, and quality Twitter posters such as @RegressedPDO, one of many independent content creators on Twitter doing a great job – she specifically focuses on the Blackhawks. There’s a lot more to a game than the basic stats, and the eye test isn’t always enough. Understanding how your team truly controls the pace and flow of the game is important. Tinker with a few tools like Sporting Charts’ Ice Tracker to see where different players score from the most often and you’ll see very quickly how data visualization and deeper stats than shots on goal can be valuable. 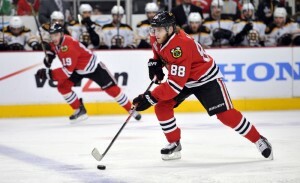 What do you feel is the main source of the Blackhawks lackluster record so far this year? Szwaja: Richards is finding his way. 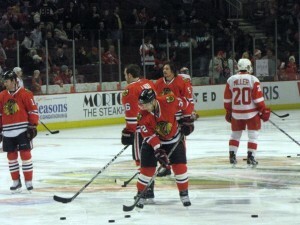 Versteeg’s rejuvenation provides an added element. Jeremy Morin’s energy can’t seem to fit in anywhere yet. Trevor Van Riemsdyk and David Rundblad are still learning Quenneville’s puck possession system. Bryan Bickell is still terrible. Put it all together and you get a maddening, inconsistent team that has trouble scoring. Veteran leadership and Quenneville’s experience will make the pieces fit, but it might take some time. Sobel: It looks to me like a lethal combination of bad luck at terrible times mixed with a salty dose of overconfidence. It seems every mistake they make ends up in the back of the net, even on games where they don’t make too many. This is a team that has won 2 Stanley Cups in the past 4 years and was arguably a single goal away from winning a 3rd. Most people agreed that whoever won the series with the Kings would go on to beat the Rangers, and the Blackhawks had to feel that way as well. It’s as if they’re playing with a Stanley Cup hangover without even having won the thing. There have also been uncharacteristically bad plays from top stars – errant passes from the nearly infallible Marian Hossa, for example – that seem to be making murmurs about age, injury or perhaps just a lack of focus and motivation. While the Blackhawks depth isn’t what it was in 2010, it’s not too far off from what they had in 2013 and it should suffice for a solid run into the playoffs. Before that happens, however, the stars need to begin leading the way again. With Detroit’s exit from the Western Conference and Vancouver’s fall from relevance, the Blackhawks are left only with St Louis as a natural heated rival. Who do you think is next? Sobel: I never thought I’d find myself saying this, but it’s looking like the Nashville Predators may well be the next serious rival. Game 5 in their playoff series in 2010 stands out in my mind to this day as the most exciting event I’ve witnessed at the United Center, and games with the Predators always seem intense and challenging. 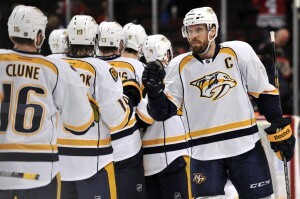 Now, the Predators have finally made the right moves to become a serious contender and it shows – with 14 games played they sit atop the Central Division and look like a team on a mission, and games between these two teams promise to be much more exciting now that the Preds play a bit more of an offensive minded game. Watch for some serious competition for the next few years. Szwaja: When I watched the Blackhawks and Minnesota Wild go at it in the Conference Semis last season, one thing stood out. Mike Yeo knows what he’s doing. His guys always seemed to know where the Blackhawks were going and what they were trying to accomplish. Admittedly, the Blackhawks got a little lucky in that series. 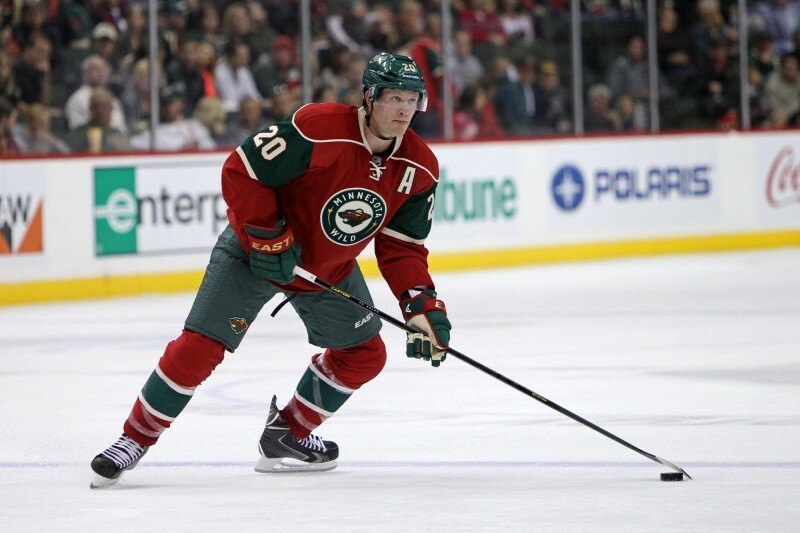 Yeo has stars at his disposal in Zach Parise (if he can stay healthy) and Ryan Suter. He has his rock in Mikko Koivu. Throw in young talent like Erik Haula, Mikael Granlund and Jared Spurgeon, and you have a solid rivalry in the making.